Last Night it was my turn to host bunko at my house. 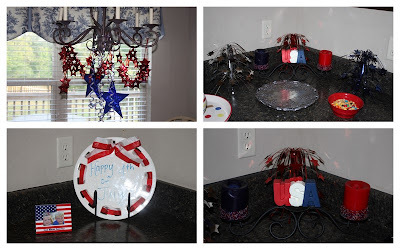 We always have a theme and mine was of course 4th of July. We make some light snacks and an adult beverage to share. And here is what I made.... 1. "White Chocolate M & M Pretzel Things" for lack of a better name :)... these were a HUGE hit... i got this idea from my MIL and you can make them with any color M&M's... they are great for baby showers, wedding showers, holidays, school events... and very easy too! You can use whatever color M&M you would like to match your party, shower, or event. Directions: On a cookie sheet lay out the pretzels, top each pretzel with a white chocolate piece, and place in the oven (250 degrees) for about 10 minutes. I left the door cracked so i could watch them and when the little "dot" on top of the chocolate pieces goes away and they look melty (not runny) pull them out and top each one with a M&M ( i place the m&m writing down so you can't see it) then let them cool and place them on a plate and serve. Directions: Mix the first 3 ingredients together and heat in a double boiler (or is a pan on low if you don't have a double boiler like me) once it melts remove from heat and add flour and vanilla and stir. GREASE your cookie sheet (so some of yours don't stick like mine did) and spoon them onto the cookie sheet. Bake on 350 for 8 minutes. Let cool just a little bit until they are not gooey and place them on a plate and serve. Directions: Cube cheese, mix rotel and DRAINED corn. Microwave for 5 minutes. Stir and return to microwave for 5 to 8 minutes longer. Serve with chips. Directions: Make the sauce... melt the butter and add the other ingredients and stir. Cut the rolls in half so you have a top and a bottom. Spread the sauce on the bottom layer of the rolls, then place a layer of ham, then a layer of cheese, then spread the top part of the rolls with the sauce and place it on top of the cheese (all this goes back into the original pan). You should have enough sauce, meat, and cheese to make 2 pans. Bake them in the over on 250 for 30 minutes. Serve warm... they are the BEST!!! Fun Girl time is always a welcomed addition here! Happy Weekend... we are off to the lake in the morning for a Powers Family Reunion and then we are leaving the kids at the lake and husband and I are headed to Montgomery for a little weekend getaway actually for a wedding but it will still be 24 hrs of R&R. (We) Well maybe I am excited to be able to get dressed without two kids hanging all over me, eat a peaceful meal, have uninterrupted adult conversation, and we get to sleep in a KING size bed all by ourselves... oh the things you look forward to once you have kids! YUMMY! Thanks so much for sharing. I can't wait to try some of them. I know exactly what you mean about time away. Doesn't matter where it is, its AWAY :) I LOL about getting dressed alone. I thought that at the beach: how nice to take my time and get dressed in peace and quiet! Glad you liked the cookies.. I want to try the hot dip.. that sounds yummy.. Looks like ya'll had fun! Did you win some money? ?